Sea Horses offered holidays in a traditional slate fronted cottage with beamed ceilings and a log burner. 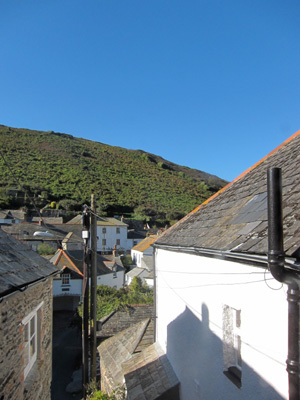 The Self-catering Holiday Cottage was located in the harbour area of Port Isaac, close to restaurants but in a quiet backstreet. Perfect for romantic weekend breaks for 2 or family holidays. Port Isaac, found on the North Cornwall coast between Rock and Boscastle is the perfect example of a traditional fishing village with its busy harbour, winding streets and alleys. It's a working village and during the summer, the fishermen still gather on Friday evenings on The Platt to sing traditional songs. At low tide, the sheltered beach offers up a feast of rockpools all waiting to be explored. For the more energetic there are miles of coastal paths offering some of the most breathtaking views in the country. If food is your passion, Port Isaac boasts a number of excellent restaurants and pubs. If you're in the mood to eat in, locally caught seafood is always available to buy from the fishmongers right by the harbour. Popular with film-makers as well as holiday-makers, Port Isaac has most recently been the setting for the TV series 'Doc Martin' (starring Martin Clunes), for which it was given the fictitious name Port Wenn.